sc = subchain(mc,states) returns the subchain sc extracted from the discrete-time Markov chain mc. The subchain contains the states states and all states that are reachable from states. 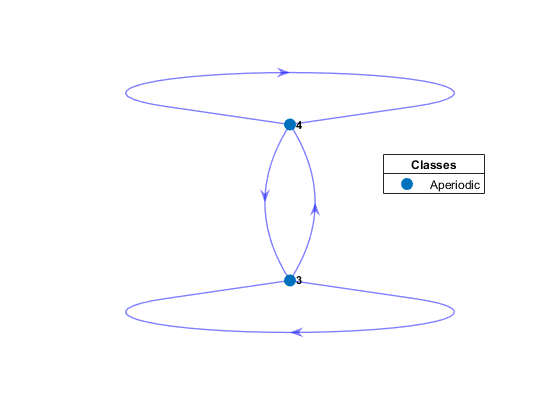 Plot a directed graph of the Markov chain. Visually identify the communicating class to which each state belongs by using node colors. Determine the stationary distribution of the Markov chain. 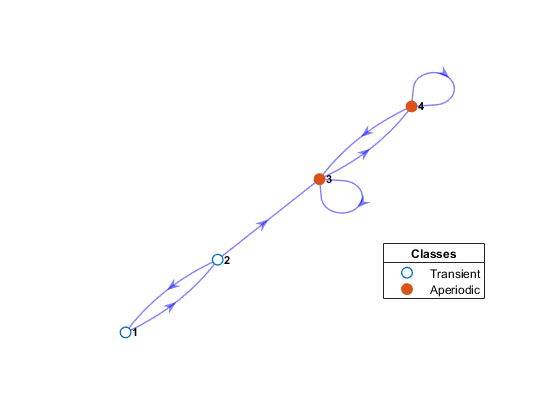 The Markov chain eventually gets absorbed into states 3 and 4, and subsequent transitions are stochastic. Extract the recurrent subchain of the Markov chain by passing mc to subchain and specifying one of the states in the recurrent, aperiodic communicating class. sc is a dtmc object. Plot a directed graph of the subchain. Create the Markov chain that is characterized by the transition matrix P. Name the states Regime 1 through Regime 4. Plot a digraph of the chain. Visually identify the communicating class to which each state belongs by using node colors. 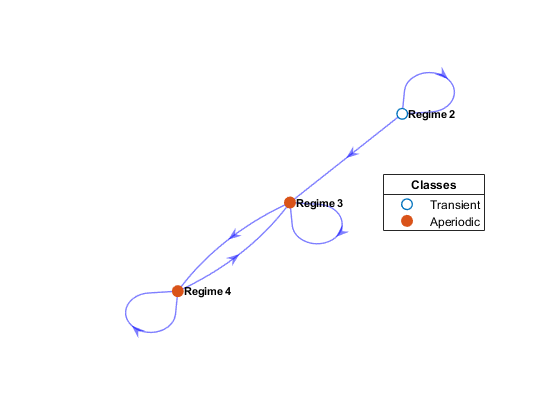 Regimes 1 and 2 are in their own communicating class because Regime 2 does not transition to Regime 1. Extract the subchain containing Regime 2, a transient state. Display the transition matrix of the subchain. Regime 1 is not in the subchain. Plot a digraph of the subchain. The plot shows a unichain: a Markov chain containing one recurrent communicating class and the selected transient class. States to include in the subchain, specified as a numeric vector of positive integers, string vector, or cell vector of character vectors. For a numeric vector, elements of states correspond to rows of the transition matrix mc.P. For a string vector or cell vector of character vectors, elements of states must be state names in mc.StateNames. Discrete-time Markov chain, returned as a dtmc object. sc is a subchain of mc containing the states states and all states reachable from states. The state names of the subchain sc.StateNames are inherited from mc. State j is reachable from state i if there is a nonzero probability of moving from i to j in a finite number of steps. subchain determines reachability by forming the transitive closure of the associated digraph, then enumerating one-step transitions. Subchains are closed under reachability to ensure that the transition matrix of sc remains stochastic (that is, rows sum to 1), with transition probabilities identical to the transition probabilities in mc.P. If you specify a state in a recurrent communicating class, then subchain extracts the entire communicating class. 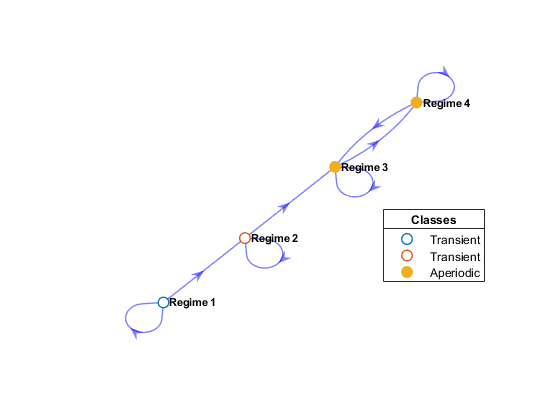 If you specify a state in a transient communicating class, then subchain extracts the transient class and all classes reachable from the transient class. To extract a unichain, specify a state in each component transient class. See classify.